In the digital age, connectivity is everything. What’s the most precious material possession you have in your life? We’re not talking about the most expensive items, or the most sentimental heirlooms – in terms of physical devices that impact your daily life, what ranks high on the list? Who is Arris? What Do They Offer? Top-Ranking Arris Modems: Which Models Made the Cut? Since so many people depend on internet connectivity at a skyrocketing rate, their networking equipment is of the utmost importance. We use the internet to communicate, to check the news, to order food, to go to school, and even to work – and even for those who only use it for YouTube and Facebook, it’s a big change to go through when the connection goes down! While you can’t control how reliable your internet service provider (ISP) is, you can choose better connection equipment. Technically, a modem is about modulation and demodulation, computing information from cable, analog, and digital signals in a complex manner – but if done right, it results in a better connection. We all know that the modem is one of the core components when it comes to maintaining a stable internet connection. Good cables, secure ports, and reliable infrastructure are all very important as well – but for the home or business internet connection, a good modem is the centerpiece. It could even be called your gateway to the internet – and much of the outside world. For this reason, it should come as no surprise that there are plenty of modem companies out there trying to offer customers the best possible product and get the most sales revenue in return. One such giant of the industry is Arris. Touting themselves as a company that refines connectivity, they’ve set a high bar to reach from the start – and they’ve reached the said bar in many ways. Their products have emerged in various circles, with multiple types of users ranging from casuals to families to professionals all using Arris modems with great success. But which one is the best? Today we’ll rank the modems – the top seven, to be exact. We’ll go over exactly what each one offers, and how they measure up compared to the competition. Rating a modem seems like a straight-forward process, right? We all know what the device is supposed to do – provide us with a stable internet connection that stays stable. Even minimal downtime is worth knowing about, and of course, the performance-to-price comparison is crucial in the decision-making process. How many problems have been reported in comparison to the number of success stories? This ratio can help customers decide if they feel comfortable buying a certain modem. How long does a modem last? No one wants to buy hardware they have to replace every few months – especially when that replacement process leaves them with no internet access temporarily! Does the modem keep a connection? Does it go in and out? This matters, no matter what price you’re paying for the equipment. Factoring in all these criteria, we’ll base our overall rating system on value and reviews. Not only should a device offer these characteristics, but they will need to have proven it through great sales numbers and overwhelmingly positive feedback. Let’s get started – here are the top seven Arris Modems! It’s got it all – sleek looks, a great list of features, and a design that saves you space. Combine that with a reasonable price tag of approximately $70, and you’ve got an easy frontrunner. With a max download speed of 686Mbps and a max upload speed of 131 Mbps, this unit is fast. It’s also compatible with most major service providers, making it great for almost anyone with cable internet. Approved by Comcast Xfinity, Cox, Time Warner, Charter, Brighthouse, and many others, this unit is versatile. Whether you want to game, stream in HD, connect multiple devices, or all of the above, this unit supports IPv4 and IPv6 internet connections at blazing speeds. Have you ever needed a cost-efficient modem that is small enough to stick on a small end table? Something that will help fit the space and budget requirements of a young college student in a dorm, or an upstart company with multiple small offices? This can be the right choice. Coming in at well below the $100 mark on most all sites, this unit is a great buy. The reviews don’t lie – the SURFboard is one of Arris’s most popular modems for good reason. This model is typically priced a little higher, though you can get a used version for around the same price as the number one entry. While this one may not have the fanfare and features to make for the top spot, it isn’t close behind. Like the SURFboard, the Touchstone TM822G offers IPv4 and IPv6 addressing modes for more connection variety and stability. The Base-T 10/100/1000 ethernet interface is something that can be useful in homes, businesses, dorms, apartments, and a variety of other locations. The unit is backwards compatible with DOCSIS 1.0, 1.1, and 2.0. In addition to that, it is also compliant with PacketCable 1.0 and 1.5. But the factor that puts it over the top is the high sales numbers and overwhelmingly positive customer feedback – this unit has helped thousands of customers enjoy a better connection. It’s another example of Arris being a company that balances cost-efficiency with connectivity masterwork. It’s a great fit for a variety of settings and is built to last. This unit is designed for simplicity – touting a one-step activation process, it takes a lot of those complexities out of networking. But don’t take its simplicity for simple design. While easy to operate, it offers an 8x4 bonded channel with built-in MoCA immunity filter and two independent 96MHz wide RF tuners to receive downstream channels up to 16GHz. This allows it to exceed expectations and deliver smooth performance in a variety of applications. Arris suggests users reach out to their ISP to check for compatibility before buying. The only downside with this unit compared to the ones above is the price. Sure, you get a unit that could be called more simplistic, but you have to pay around $100. It isn’t a ridiculous sum to ask for a high-end modem, though, so this model easily makes our top three. It’s a sleek, space-efficient, well-built machine that gets the job done. Like the entry above, it is known for versatility and even more for simplicity. The modem at work slowing down your productivity due to cumbersome configuration needs? The modem at mom’s house making her connection a little unstable? Try out the CM820A, and embrace a simplistic approach to good connectivity. The second SURFboard on our list is the SBG65820. One look at its max download speed will show why it ranked below the other. But 343Mbps max is not bad, by any means, especially not for a unit in the neighborhood of $80. Like the other, it is compatible with more ISPs than not – with only Verizon, AT&T and CenturyLink users left out. But it’s easy to switch, and some may consider it given this device is a two-in-one unit that doubles as an N600 Wi-Fi router. There’s also eight download and four upload channels – meaning this unit can be great for a house full or an office full of users. Finally, it is built with 4 separate gigabit ethernet ports and is perfect for locations around 2,500 square feet. A great unit that easily earns a spot in the top five. 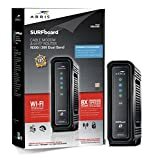 Not as robust as the other SURFboard but offering a bit more in the way of total connection options this unit is one of the best Arris modems on the market. Designed for compatibility with major US cable provider Comcast’s internet and phone service, this unit also boasts download speeds of 343Mbps like the model above. It offers 4x4 channel bonding and meets DOCSIS 3.0 specifications. It is also backwards compatible with DOCSIS 2.0, 1.1, and 1.0. With unlimited long distance calling nationwide plus standard local calling options, this unit is one that can pay for itself depending on what features a buyer is looking to save on. With high speeds capable of competing with popular competitors, the TM722G excels in most areas, all for a price that can stay below $50 if you’re a smart shopper. The idea of telephone and internet connectivity options is important to remember – because the two are inseparable, or at least close enough related that there is some technological overlap. Arris shows here how the technologies can be bundled with value in mind. It’s a very cost-efficient model that excels in the unique area of telephonic connectivity. And with solid internet speeds all around coupled with great backwards compatibility options, it’s a cheap all-purpose solution. By far the priciest model on our list, this unit retails for over $200. But its features are better than anything mentioned thus far, too. It’s a great unit if you’re looking to spend a little extra to get a more capable piece of hardware for faster connection speeds. With a whopping 1Gbps download speed cap, this unit is built for the fastest services offered by modern ISPs. Built for Comcast Xfinity Internet & Voice Service, it is perfect for businesses or work-from-home professionals who need top speeds because time is always a factor. It features 24 download and 8 upload channels for more connectivity options, plus two telephone ports for Xfinity Voice devices, and RDK-B technology to support budding devices. It’s built for speed, versatility, and the future – you can feel comfortable investing in this equipment. The only reason this model doesn’t rank a bit higher is that of the price. It’s made for big needs, but it is still robust enough on its own merits to land on our list. This touchstone model is DOCSIS 3.0 compliant and offers IPv4 and IPv6 addressing modes. That includes two-way speedy internet service capabilities. At only around $50 new and sometimes available for half as much used, it is easy to see the biggest perk of this unit is the price. 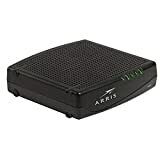 When you’re looking to save money on an Arris modem, you may find this unit at the top of most suggestion lists. We put it closer to the bottom because it doesn’t have the features of the others. But it does stack up to other low-cost modems from other brands, making it a great choice to round out our top seven. The unit is great for what it offers – solid connection capabilities, a simple and attractive design, but best of all, value for your dollar. When you’re browsing Arris modems, how do you decide which is the best fit for your money? To be sure, you need to know exactly what you’re looking to find. Do you need something that takes up less space or costs less money? Or are you focused on finding a device that offers higher connection speeds and more connectivity options? Arris modems run the spectrum, offering combinations of features and value for buyers of all budgets. Any unit on this list is a good option, as are many others in the Arris product line. 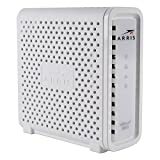 No matter what type of modem you need or what you’re looking to spend, Arris modems are a popular choice for good reason. Next articleGTX 1060 Review – Is It One of the Best GPUs Available Today?